The Devil was a busy little bee in days gone by. Some might say he still is, but in any event he crops up all over the British landscape – including at the Tarr Steps, a famous clapper bridge over the river Barle, Somerset, in the Exmoor National Park. 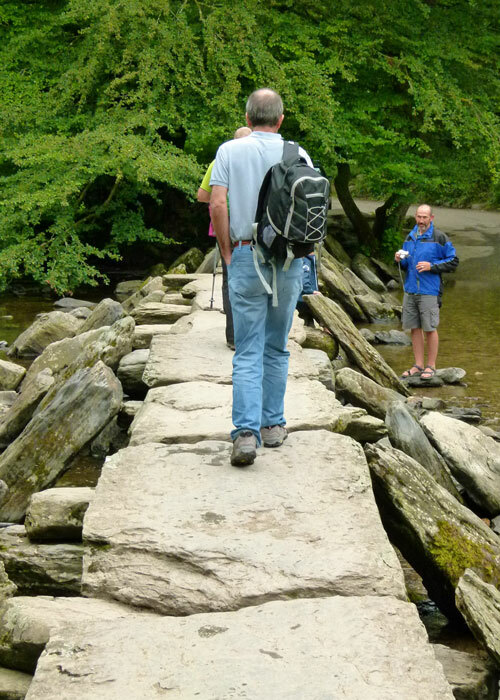 Clapper bridges, river crossings of dry-stone construction using stone slabs resting on river banks and stone piers, are found all over upland Britain. The term ‘clapper’ is derived from the Latin ‘claperius’, meaning ‘a pile of stones’ – apparently. 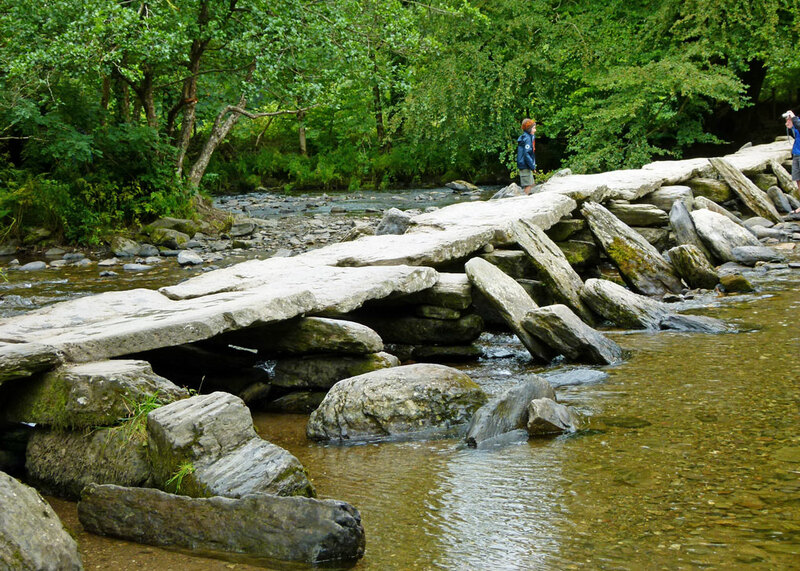 In any event, ’tis said that the Devil constructed the Tarr Steps for a bet – some claim with a local giant, who maintained that there was no way the Devil could build a bridge over the river in a single night. Popular local myth also says that the Devil asserted sunbathing rights on the bridge and threatened to crush anyone who tried to use it. The brave locals sent a cat across to test this threat, but the poor moggy was promptly vaporised. Zap! A worldly-wise vicar then stepped up and had a swearing match with the (presumably) nicely tanned ruler of Hell, who eventually gave way to this plucky parson and said oh, alright then; it was OK to use the bridge provided he wasn’t on it at the time, soaking up the rays. All of which sounds rather unlikely, doesn’t it? Especially the sunbathing bit. 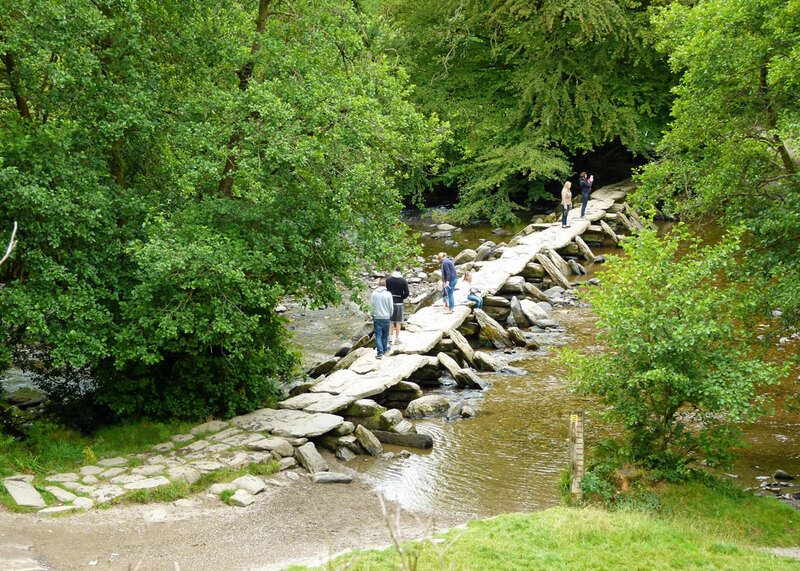 There are those who believe that Tarr Steps was built 3,000 years ago; but the earliest written reference dates from the 14th century and most experts agree the bridge is medieval. Doubtless there was a crossing point over the river in ancient times, though – and there is still a ford next to the bridge. 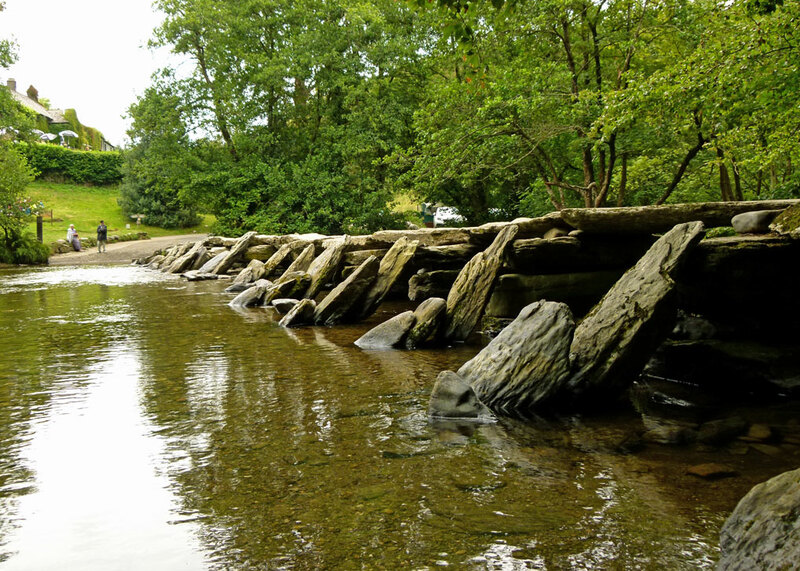 Tarr Steps is said to be the longest clapper bridge in Britain, a Grade I listed structure 180 feet (55 metres) long, consisting of 17 spans with each slab weighing from 1 to 2 tons. The largest slab is about 8 feet (2.4 metres) long. The parts are, very cleverly, numbered – not by the Devil or whoever built it, but by modern man, to make the bridge easier to rebuild when it is wrecked in bad weather. The last time this happened was in 2012, when a 10 foot wall of flood water brought trees and other debris down the Barle, sweeping away the protective cables that had been laid upstream, and crashing into the old stonework. An image of some guy in a hi-vis casually lifting up the corner of one of those massive stones, checking for a part-number, appeals to my sense of the absurd; but the idea of course makes a lot of sense. And it does make you wonder how it was originally built, without the benefit of the lifting equipment used today to repair it and slot the numbered parts into place. There are walks hereabouts, including a short circular one through a nature reserve where there are things growing, wild animals and so on. But we were lazy; having been driven there by a friend, we parked in the National Park ‘Pay and Display’ car park and just wandered the ¼ of a mile or so down the hill, and back. The bridge is amazing, and curiously beautiful. There were a lot of people messing about in the water nearby and, though the bridge is easily wide enough for two to pass, I was a little nervous lest some bouncing child, careless of the elderly and infirm, forced me into the gushing ankle-deep torrent 3 feet beneath my trembling boots. Fortunately, there is an excellent establishment, the Tarr Farm Inn, just next door, where we had an extremely pleasant lunch and one of the nicest pints of ale I’ve had in a long time. I felt much calmer after that. So you really should check your souls when crossing the Tarr Steps. Ah… Exmoor, my home area. I’ve been across the Steps a few times, beautiful place. And I didn’t see the devil, he must have been busy somewhere else. A great place to explore the River Barle on Exmoor. There’s a circular walk that will take 1 to 1.5 hours along one river bank, over a footbridge and back on the other bank. The route is reasonably accessible for those with suitable footwear. There’s the opportunity for longer walks if you would like. The car park is a little way from the bridge, down a footpath. The old stone clapper bridge is worth the visit even if a longer walk doesn’t appeal to you. I love it when you visit places close to my heart. Tarr Steps has long been a favourite of mine and somewhere we took the children when they were small. It’s got so much charm and so far I’ve managed to cross the bridge without being vaporised! We loved it. And a great pint in the pub next door. Incredible place to stroll about! Doesn’t that bridge look amazing. This is a fascinating construction. I had not heard of them before so it is nice to see your photos of the steps. Test – couldn’t leave a comment yesterday, trying again now. I’d not know such types of bridges existed and were still around in some places until reading your post. Crossing the bridge wouldn’t be a problem for me – see who has the nicer tan, the Devil or I! I’m sure I’ve read about those before, fascinating bridge. But are you classifying yourself witht the “elderly and infirm”!? Say it isn’t so! It looks fantastic… I’m wondering if I wouldn’t be a bit afraid to cross though. Didn’t know about the Devil story! I have a painting of the Tarr Steps and it is one of my favourite things and it is a favourite place too! I have never heard of anyone going to England to get a tan. I like the idea of the worldly wise vicar having that swearing match! I have never seen or heard of these kind of bridges, truly fascinating. Wish I could see one. So clever to number the stones so they can be put back! A fascinating place. I have heard the story before at some point. You might have heard it on A Bit About Britain Mark I! A good one Mike. Lucky that Inn was nearby so you could calm your nerves after the trecherous crossing. Even the devil would approve of that. The bridge is a wonder – I can’t imagine how it was originally constructed. This place is going on my list. It does look an unlikely spot for sunbathing though. Too many trees.